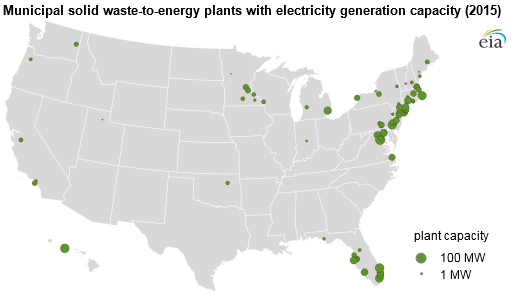 At the end of 2015, the United States had 71 waste-to-energy (WTE) plants that generated electricity in 20 U.S. states, with a total generating capacity of 2.3 gigawatts. Florida contains more than one-fifth of the nation's WTE electricity generation capacity, and in 2015, Florida's Palm Beach Renewable Energy Facility Number 2 became the first new WTE plant to come online since 1995 and the largest single WTE electricity generator in the United States. WTE plants account for a relatively small portion of the total U.S. electric capacity and generation, providing about 0.4% of total U.S. electricity generation in 2015. WTE power plants convert the combustible content of municipal solid waste (MSW) to energy. MSW contains biomass (or biogenic) materials like paper, cardboard, food waste, grass clippings, leaves, wood, and leather products, as well as nonbiogenic materials such as plastics, metals, and petroleum-based synthetic materials. The biogenic component of MSW makes up about 59% of the total tonnage, but because of a lower heat content (i.e., less energy value), it accounts for about half of the total net electricity generation. In 2015, Florida and four states in the Northeast accounted for 61% of the total WTE power plant capacity in the United States, and they produced 64% of total U.S. WTE electricity generation. WTE plants are primarily intended as a MSW management option, with electricity generation a secondary benefit. Burning MSW reduces the volume of waste by about 87%. The remainder is ash from air pollutant emissions control systems, ash from the combusted material, and noncombustible materials. About 90% of WTE electricity generation capacity was added between 1980 and 1995, when landfilling MSW was relatively expensive. In the early 1990s, as the mercury and dioxin emissions implications associated with combusting MSW began to be recognized, most existing facilities had to install air pollution control systems or be shut down, and the construction of new MSW-fired electric generation capacity came to a halt. Although Florida's Palm Beach facility is the first new WTE plant to come online since 1995, some WTE generation capacity has been added to existing WTE plants since then. Based on the most recent estimates from the U.S. Environmental Protection Agency, the United States produced about 254 million tons of MSW in 2013. EIA estimates that WTE plants burned about 29 million tons of MSW in 2015, of which 26 million tons were used to generate electricity. 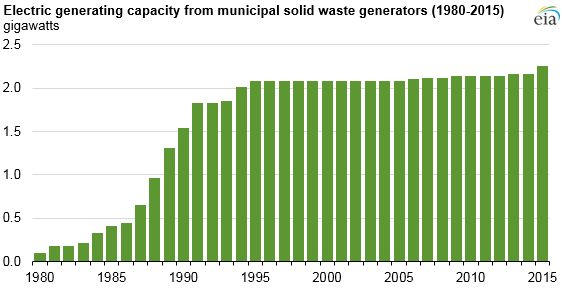 The remaining tonnage of MSW was either recycled, composted, or disposed in a landfill.